Do you need to kick start your diet with antioxidants and probiotics? We carry a method to do just that. Most people have a difficult time getting enough fruits and vegetables in their diet. That causes their system to be deficient in antioxidants and prebiotics. We carry Nutri-Dyne’s Fruits and Greens to help you get a great amount of antioxidants into your system! The best way to get antioxidants is to eat fresh fruits and vegetables, but when we get busy it is nice to have a supplement to your diet. What are some great foods with a high amount of antioxidants? This is a great list that is not even close to comprehensive! The best thing about these fruits and the supplement that we carry is that they contain prebiotics! Prebiotic is food for your healthy probiotics. This is just as important, if not more important, than taking probiotics. 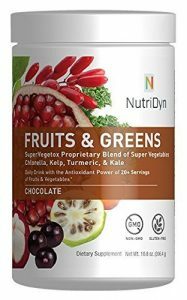 Our Nutri-Dyn Fruits and Greens gives you a bonus probiotic to help repopulate your digestive system. Some of our patients are telling us that they use it as a sugar substitute, because the flavor is so sweat! I think that is a great idea! If you have any questions about Nuti-Dyne Fruits and Greens or antioxidants please give us a call at Cannon Pointe Chiropractic at 507-645-8000.